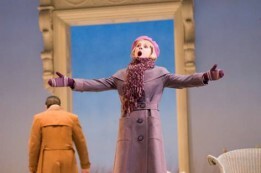 Suzanne Rigden is an acclaimed Canadian opera singer. A resident of Montreal, she travels the world making her mark as a coloratura soprano on the international stage… so what’s she doing at the Blue Nose Marathon? Suzanne was born and raised in Halifax-Dartmouth. Coming from a musical family, with fiddler grandfathers, a music teacher / pianist mom, and a jazz saxophonist / concert band clarinetist dad, music has always been an important part of her life. Her early training included voice lessons at Halifax’s Maritime Conservatory, piano, flute, ballet and jazz dancing with Coastal Dance, and singing in many choirs including the National Youth Choir of Canada. “When I was young, I was brought to many Symphony concerts with musician parents and family members. I felt very lucky to be able to attend such wonderful events. I have no doubt that this helped to sculpt my future as I became a classical musician myself and have even sung as a soloist with the Symphony! “As a native Blue Noser and fellow musician and runner, I felt that this was the perfect cause for me to contribute to. Every dollar I raise goes to support Symphony Nova Scotia’s education and outreach programs. This is something I hold near and dear to my heart because my mother, as a music teacher, was very involved with it and the kids had so many wonderful opportunities to interact with the Symphony over the years. “I remember going to see the Nutcracker at the Cohn with my aunt when I was about 6 or 7. When did you know you were headed for a career in music? You have a personal connection to Symphony Nova Scotia. Tell us about it. “The Symphony hired me for my second Oratorio gig back in March 2010. It was early on in my career and really helped me to go further in my career, as one needs experience to get more contracts. As an opera singer, you are more likely to be hired from a performance than from an audition, as it shows more of what you can do and acts like a stamp of approval from another company. When you think of Symphony Nova Scotia what comes to mind? Why should Nova Scotians support the Symphony as ticket buyers? Why should Nova Scotians support the Symphony as donors? Why is it important to ensure the symphony experience will be available for future generations? To learn more about Suzanne, please visit her website here.